We have a number of “War Graves” in Holy Trinity Churchyard that are maintained by us at the behest of the Commonwealth War Graves Commission. Other casualties have been buried in, or are commemorated on, family plots. Mr. Ian Williams has located memorials in the Churchyard to the fallen of The Great War (1914-1918) and the Second World War (1939-1945). He has written an excellent booklet entitled 'War Memorials of Amblecote Part 2 The Men and Women' which is published by the Amblecote History Society. 2nd/6th Btn. South Staffordshire Regiment, 10.12.1917. Died at a military hospital in Etaples from the effects of being gassed. Buried in Etaples Military Cemetery, Pas de Calais, France. He was 21 years old and had been a server here at Holy Trinity. Served with the South African Railway Engineer Corps. Until 1913 and then the South African Engineers until 1915 when he became an air mechanic with the Royal Flying Corps. He died from anaemia in Connaught Hospital in Farnborough. Aged about 28 years. He is buried with his wife. A casualty of the campaign in Mesopotamia where he took part in the attack on Kut-al-Amara in January 1917. He was taken prisoner by the Turks and died of typhoid in Turkey aged 38 years. He is commemorated on the Basra Memorial, Iraq, at St Thomas, Stourbridge and on his parents' grave at Holy Trinity. Was killed when a shell landed in the trench he was occupying. He is commemorated on the Cambrai Memorial and, like his brother, at St. Thomas, Stourbridge and his parents' grave. The third son of Richard and Sophie Clasper died during an artillery barrage during the German offensive in Artois aged 20 years. He is commemorated on the Arras Memorial and with his brothers at St. Thomas, Stourbridge and on his parents' grave. Died in the 30th Military Hospital at Alnwick in Northumberland from septic pneumonia/influenza after being gassed. He was 30 years of age and had been a chorister and was married at Holy Trinity. His sudden death was reported in the County Express although no cause of death was recorded. He was 45 years of age. He was killed by shellfire aged 30 years. He is commemorated on the Ypres (Menin Gate) Memorial and also on his parents' grave at Holy Trinity. Was admitted to hospital in France in May 1918 suffering from pains in his right side caused by abscesses on his kidney. He was transferred to St. Georges Hospital in London but contracted influenza and died. He is buried in the Churchyard at Holy Trinity. Charles died from exposure in Gallipoli and was buried in Hill 10 Cemetery, Gallipoli leaving a widow and five children all under the age of 12. Died of internal injuries following amphibious landings in Northern Italy. He was just 19 years of age and is buried in Udine War Cemetery in Italy. Was wounded in the head fighting in Normandy during or after the D Day Landings. He was brought back to a hospital in Oxford where he subsequently died aged 21 years. The younger son of Alfred Leighton is buried in Holy Trinity Churchyard. Discharged from military service on 24th December 1918 after suffering from the effects of gas poisoning in France. He was given a Military Funeral and is buried at Holy Trinity where he had been a choir boy and altar server. Company Sergeant Major (W.O.II) Joseph Nicholls M.M. He had completed 21 years army service and seen much fighting in France. Wounded once and gassed on two occasions he had been in England for 6 months and had been in hospital in Essex. On leave to visit his married sister in Amblecote he appeared depressed, was in ill health and frequently vomited blood. He complained of chest pains and retired early to bed. He was discovered the next morning lying in the garden with his throat cut. He had committed suicide. Captain D'Arcy G. St. Clare Roberts M.C. Fought in the Gallipoli campaign of 1915 but caught malarial fever. Evacuated to Malta and then to England for recovery. In 1916 his Battalion was stationed on the Somme. After further sickness and injury he returned in time for the battle of Arras in April 1917 and was wounded again in May. He recuperated in England and returned to France just before the German Spring offensives of March 1918. The Germans were finally halted at Villers-Bretonneux but Captain Roberts was killed aged 27 years. He was buried in Adelaide Cemetery, Villers-Bretonneux and commemorated on his parents grave in Holy Trinity Churchyard. He was wounded in July 1916 and again in October at the Somme and was invalided back to England where he died in Worcester aged 24 years. Enlisted in December 1915 he is buried in Buffs Road Cemetery, Ypres, Belgium and commemorated on his parents' grave at Holy Trinity. He was aged 20 years. 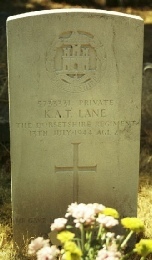 Killed in action aged 24 years. He was engaged in the suppression of the Irish rebellion before serving in France. He was buried in Hargicourt British Cemetery, Aisne. Entries in blue are listed as ‘buried at Holy Trinity’ on the Commonwealth War Graves website.